Beautiful Pavers To Fit Every Style! We've got all the colors, sizes, and shapes! When installed correctly, pavers can be both more attractive and tougher than alternatives like concrete or asphalt. It's important to have professionals do the job so that the results will be flawless. In order to ensure you get the best out of your patio or driveway, our team will follow a careful installation process that guarantees excellent durability, drainage and long-lasting appeal. The first step is to lay the foundations for your new layout. We will clear away any old surfacing materials, then dig into the earth. We'll remove tree roots and rocks that may obstruct the foundations, then lay a sheet of weed-control fabric. This helps to prevent unwanted plants from growing beneath your new pavers, potentially disrupting their look or damaging the structure. The second stage involves filling the foundations with a layer of gravel base. For heavy-use areas like driveways we’ll typically lay up to 7” of this material, while patios might only require 3-4”. This gravel is sloped to allow for proper drainage, then it is watered and compacted. Once dry, the gravel provides a firm yet porous base for your pavers. On top of this we apply a layer of base sand, which we spread evenly across the gravel. Now it’s time to lay some pavers. Keeping carefully to the design you’ve decided on, we’ll cut and shape the tiles to the right sizes, leaving no more than half an inch between them. Once the design is complete our team will cut a small trench around the outside and use concrete to create a border; this is essential, since it keeps the bricks from shifting after the installation process is completed. The pavers are ready - all we need to do now is set them in place. We fill all the gaps between the tiles with joint sand and then moisten them. This activates the polymeric joint sand and makes it harden. 24 hours later, we apply the final layer of brick sealer to protect against stains and UV rays. Congratulations, your new paved section is ready! 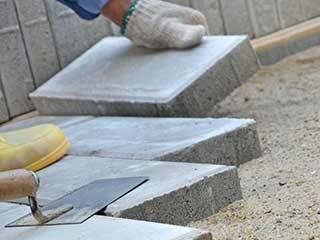 If you’re thinking of investing in a new patio or driveway, S&P Hardscape Remodeling Los Angeles is ready to help. Contact us today to find out what we can do for you. What do you put under pavers? What does laying pavers directly on soil entail? Laying pavers directly on soil is recommended as a temporary solution, ideally for only a year or two. Once the exact size of land needed is calculated, all the vegetation, including the grass and the weeds, must be cleared, and the soil dug up to the thickness of the pavers plus 2”. Ensuring the ground is completely flat is crucial, so using a hand tamper is helpful. The next step is adding 2” of sand, which should be leveled again, resulting in an even spread over the entire area. Next, the bricks/stones are laid while each is tapped with a rubber mallet to set it ½” into the sand. Once all the pieces are leveled, sand is spread and pushed with a broom into the spaces between the pavers until all the gaps are filled. A keen eye and experience are necessary for this type of project, thus contracting a professional is a good decision.